1) Visiting patients in hospitals and giving financial assistance to the needy. 2) Financial assistance to the economically backward girls for their wedding. 3) Visiting orphanages and destitute homes and offering them cloths, Food and financial assistance. 4) Actively participating in all the developmental programmes of the church. Currently there are more than 50 active members in the Mahila Samajam under the guidance of the Vicar. Mahila Samajam is conducts prayer meeting on every sunday after Holy Qurban. Every Thursday at 1.00 pm, Vanitha Samajam meets at the church for prayer and group discussion. Those who wish to offer help to this noble cause may contact the secretary. Under the guidance of the Headmaster Mr.John Poulose, the sunday school is working in a very systematic manner. The classes begin on all sundays at 10.30 am and goes on until 11.30 am. The students are also given opportunity to exploit their talents in singing, writing, and public speaking. The students of our sunday school has won several prizes in various competitions organised by MJSSA at district and Diocese level. In the current academic year of 2018, we have a student strength of nearly 100 in the various classes from KG to 12 std. The students are guided by 31 dedicated teachers. The St.Ignatius church youth association was established in June 2000 under the guidance of Vicar Rev. Fr. Jacob Kuruvilla. Under the leadership of V.Rev. Fr. Baby Chamakala Cor-episcopa, the youth association has been playing an active role in all the activities of the church including church construction, christmas carols, perunals, etc.. The association is providing scholarship for financially backward meritorious students. The church website is developed and maintained by the association members. The youth association also contributes towards charitable activities organized in the church and also conducts Medical camps for the financialy backward people in the community. 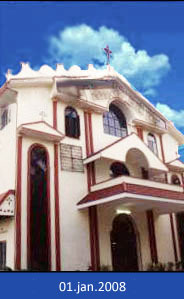 The Pakalveedu of the church was established in 24th oct 2013,under the guidence of vicar Rev. FR. Samson Kuriakose, Meloth. Pakalveedu is basically for retired and aged people. Every thursday 50-60 people assemble in the parish hall for Bible Class, group discussion, etc under the leadership of the Church vicar. The classes normally continue up to 1 P.M. Pakalveedu celebrates the birthday, wedding anniversary of members by cutting cakes and sponsering the lunch. In the afternoon there are different types of indoor games, yoga classes and other entertainment programmes suitable for aged people. There are 4 family units under 4 conveners in diffrerent parts of the town. The family units meet at the residence of chruch members in the evening of saturdays or sundays for Bible Class .Bible Quiz ,Spiritual Speech and prayers under the chruch vicar. On second saturday evening all family units assemble in the church for the evening prayers and Bible speech.